The Transparent, 'High-Quality' Donald Trump Jr. High-quality man in a high-quality elevator. Image via Getty. 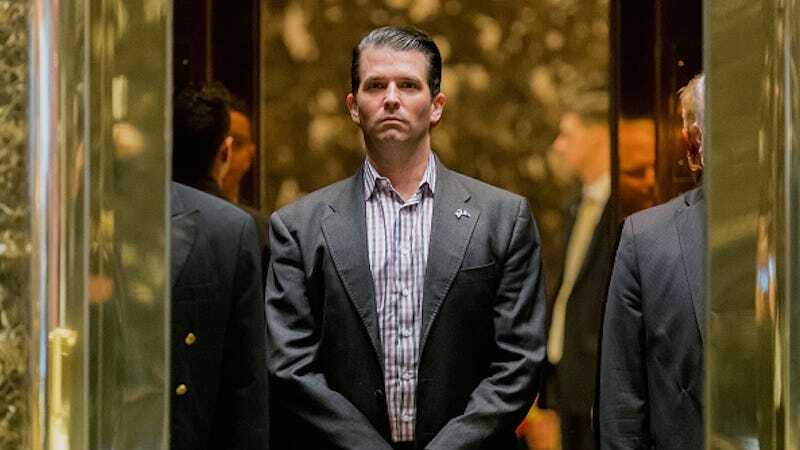 Shortly after Donald Trump Jr. released an email exchange between himself and music publicist Rob Goldstone, the president praised his eldest son, calling him a “high-quality person,” applauding his “transparency.” Donald Trump’s focus on “transparency” echoed his son’s insistence that his decision to release the email exchange was born of “total transparency.” The emails are astounding, an explicit acknowledgment that the Trump campaign met with interested foreign parties to “incriminate Hillary” as “part of Russia and its government’s support for Mr. Trump.” At the time of the email exchange, Trump Jr. was enthusiastic, writing “If it’s what you say I love it,” and agreed to meet with lawyer Natalia Veselnitskaya. Though Trump Jr. initially told the New York Times that the meeting with Veselnitskaya was over programs on Russian adoption, he later reversed course and shared the emails on Twitter as an act of apparent transparency or, at least, to publish them before the Times had a chance. The initial lie was, according to the self-aggrandizing claim of transparency, unimportant in the face of such boldness. By Tuesday evening, Trump Jr. argued that his “transparency” demonstrated “a nothing.” “Such a nothing,” he repeated over and over again during an interview with Sean Hannity. He also noted that he was “still way in the learning curve on all of this,” suggesting that incompetence was the natural course of nothingness. Regardless, transparency quickly became the talking point that jelled around Trump Jr. Shortly after his appearance, Jay Sekulow also appeared on Hannity reiterating the early talking point of transparency. “[Donald Trump Jr.] put forward the entire chain of emails, he didn’t delete them as others have done in other campaigns,” Sekulow told a nodding Hannity. In response to his son’s appearance on Hannity, Trump again celebrated transparency. “He was open, transparent and innocent,” the president said about the interview. Soon after, Trump loyalist all praised the president’s son for his “transparency.” Katrina Pierson and Michael Cohen both indicated that “transparency” was the moral equivalent of honesty, proof of leadership from a man who is ostensibly neither a leader nor a politician. Anthony Scaramucci used the translucency image too, writing that he was “proud to call” Trump Jr. “a friend.” “The truth is crystal clear,” he wrote. It’s not exactly clear what the truth is or whether or not Trump Jr. is in violation of a campaign finance law. NBC reports that some legal experts believe that he may “have violated a federal statute that says a political campaign cannot ‘knowingly solicit, accept, or receive’ any ‘contribution or donation’ from a foreign national.” But whether or not Trump Jr. was in violation of the is decidedly beyond the point for both the president and loyalists. Incompetence, or lack of knowledge about the laws governing campaigns and politicians, has long been a favored defense of the Trump White House (it was used by Republican senators to defend the president during the Comey hearings) and it’s not surprising to see it reiterated here with such vigor. But here, transparency combined with incompetence and nothingness is particularly convoluted, even for the Trump administration. But Trump’s praise of his son, a “good American” whose patriotism, innocence and morality were demonstrated by a tweet, is telling. Trump cares little for action and more for image. His conflation of image with value is typical of the president’s language. Trump is fond of sorting people by their aesthetic value as well as their materiality. Those who are loyal are “good” people, people of value or “high quality” people who simply make mistakes. They exist in contrast to those who are not, they are simply losers, liars, “nuts” or “phony hypocrites.” Instead of acting with transparency, enemies are a mess of fluids, they leak and they bleed. But despite the endless news about Russia and Trump’s alleged frustration that he can’t shake the story from the headlines, he remains committed to his enduring belief that images can be made real; that he can batter enemies by reducing them to a pool of fluids and turn his son into “high-quality” crystal simply by saying so. If the goal here is simply the transformation of reality, then it has run its course straight to the unseeable. The best the Trump administration can offer up here is a series of invisibilities: transparency, nothingness, quality, and good men.